At the start of April the juveniles at Durrell nominated for release were transported to Sorel. Catching them up out of the main display aviary proved a little trickier than first thought! Having witnessed the breeding pairs being trapped and having vague flashbacks to the year before (if birds indeed do that) the juveniles were apprehensive to say the least. 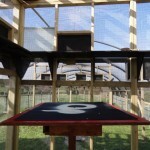 Keeper sat with baited trap and baited breath waiting to catch up four out of the seven birds in the aviary. Day 1 was fruitless. Day 2 saw B6974 and B6978 caught up (technically B6973 was also in the shut-off but evaded capture). Finally – Day 7, albeit with a two day break, saw the last two captured; B6973 and B6977. 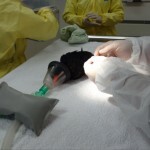 All four juveniles had to undergo visual health checks by the vets before moving to Sorel. 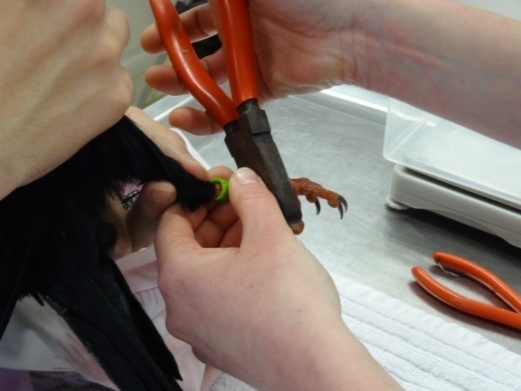 Three had already been fitted with radio transmitters so this was an opportunity to check attachment and the birds’ feather condition. B6977 was fitted with a radio transmitter and all four had Channel Islands metal rings attached to their right legs. Two of the birds had their existing plastic rings swapped for a different colour to avoid duplication with choughs already at Sorel. During the catch-up process it was noticed that B6975 had lost her dummy radio transmitter. From previous observations we think the transmitter had fallen off in the past couple of weeks. 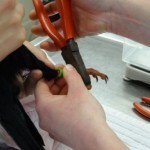 On examining the bird there was a new feather growing where the transmitter would have been glued on. 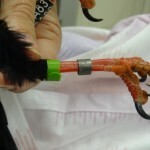 The adjacent feather, which would have been tied to the antennae, showed signs that the tag, once unstuck, moved down the feather shaft and fell off. This transmitter had been attached for over five months, so it is not a grave concern, but is of interest. The birds with the real transmitters attached will naturally moult within this time period anyway. 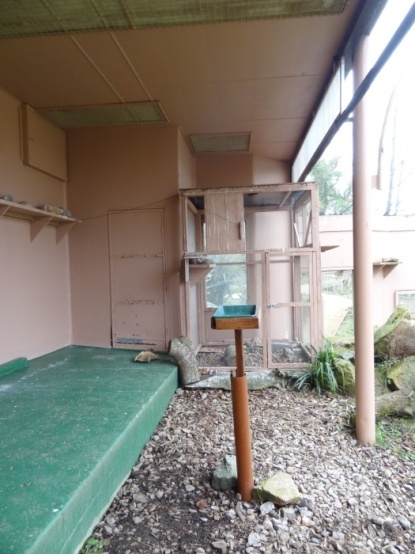 When the Durrell birds were moved into Sorel there was a lot of interest from the other, Paradise Park, birds. No aggression was observed just lots of vocalising. This was a positive sign that the two groups would get on once mixed. After a few days living next to each other and adjusting, the hatches between 1A & 1B were opened to allow the groups to mix. The Durrell birds seemed more interested in their new surroundings than in interacting with the Paradise Park birds. The Durrell male (green) was seen to order around a few individuals at the start, but no one was chased or blocked from getting to food. This may have had a lot to do with them being juveniles and not breeding pairs. However, we did notice male and female ‘pairings’ even at this early age. Black and Orange from Paradise Park hang out together and Green and Mauve from Durrell do likewise. We have also seen them pick up and carry around twig-like vegetation. 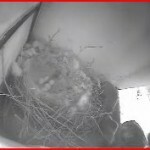 One bird has gone a step further and carried material up to the top of a shelter box. A fruitless task since the wind clears anything within seconds, but at least it keeps them occupied! 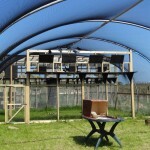 Durrell vets have visited the aviary on a couple of occasions this month. 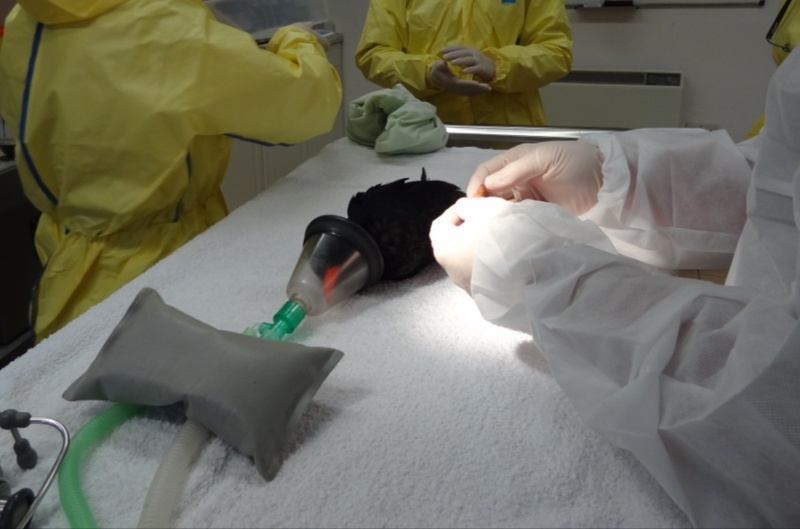 On the 10th the Paradise Park group had to be caught up to be given Ivermectin injections. They also had blood samples taken whilst in the hand. All juveniles had put on approximately 20g in weight since arriving in Jersey. Weight gain was expected but needs to be monitored if the training is to be successful. George, the tame adult, had not put on any weight and started to become more of a concern towards the end of the month. He was spending more time lying down even when the keeper was present. It was difficult to know whether he was depressed from being alone (he still hadn’t ventured into the polytunnel with the others) or through a physical illness. When the hatches between 1A and 1B were opened he became a little perkier since he could mix with the Durrell juveniles next door to him. However, as the juveniles became braver and spent more time in the tunnel George was back to being alone again except at feed times or when sheltering from bad weather. George’s mobility looked to be declining and he was immediately put on a course of an anti-inflammatory drug given to him in his insect feeds. This made a brief improvement until the course finished. On two occasions after that he grazed his toe on the left foot. Fear of infection and further decline in condition meant that George had to be moved back to Durrell to be housed in the Veterinary Centre. Under anaesthetic, several X-rays were taken and George’s feet were examined. He came to Jersey with bumblefoot on his right foot. This is a bacterial infection and inflammatory reaction affecting feet. George’s rotated left leg means that he will load more on his right and has probably aggravated if not caused this issue. A swab was taken from the site of the bumblefoot. In house Lab analysis identified the bacteria present and George was put on a course of antibiotics as well as the anti-inflammatory medication. Bio-security legislation requires George to undergo a quarantine period whilst with the vets before he can be moved into one of Durrell’s aviaries. He gets a lot more attention in the Vet Centre than at Sorel so his mood quickly improved although his physical condition is still a struggle. We will review his situation once the antibiotics have finished. 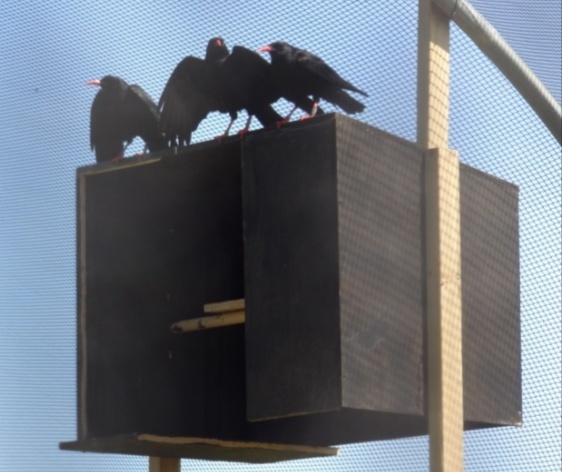 The choughs are being trained to fly in and out of the release hatches (within the aviary)on a whistle command and rewarded with food. 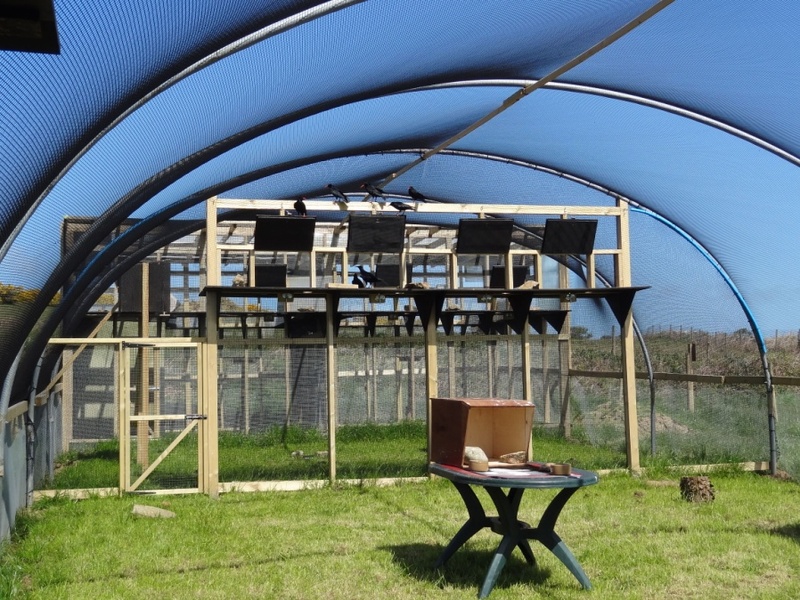 This is to ensure that during the early stages of the soft-release the birds will come back to the aviary and that they can be safely locked in overnight. 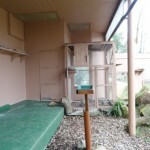 They will learn that the aviary is a safe shelter and holds food resources if they struggle to locate any in their first few months exploring the coast. 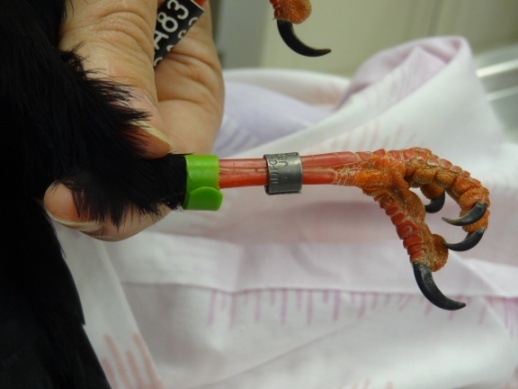 In the long term this should also help with monitoring their condition after release. 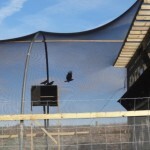 To achieve this, the aviary has been designed to let keepers train the choughs to go through an internal set of hatches before attempting the external release hatch. 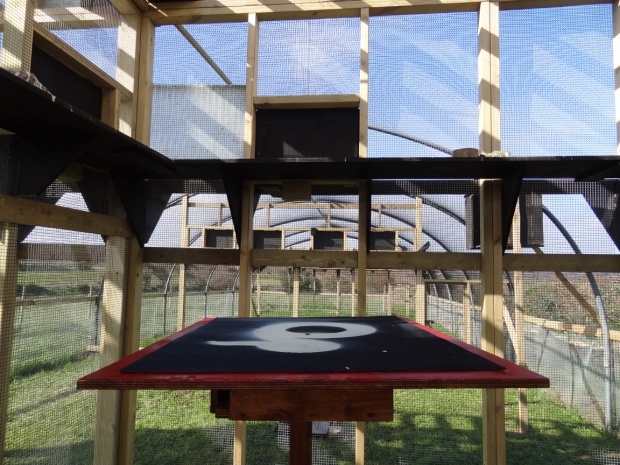 There are large target boards on the food stands and two tables in the polytunnel (kindly donated by Tony Pirozzolo at Café Firefly). Hopefully the birds will start to associate these boards with food and will easily spot them when flying around after their release. The birds responded well when they had access to the first half of the polytunnel. Whilst still nervous of the keepers they would fly in for food once the keeper had blown the whistle and left. When they were given access to the entire polytunnel they started to become less responsive. 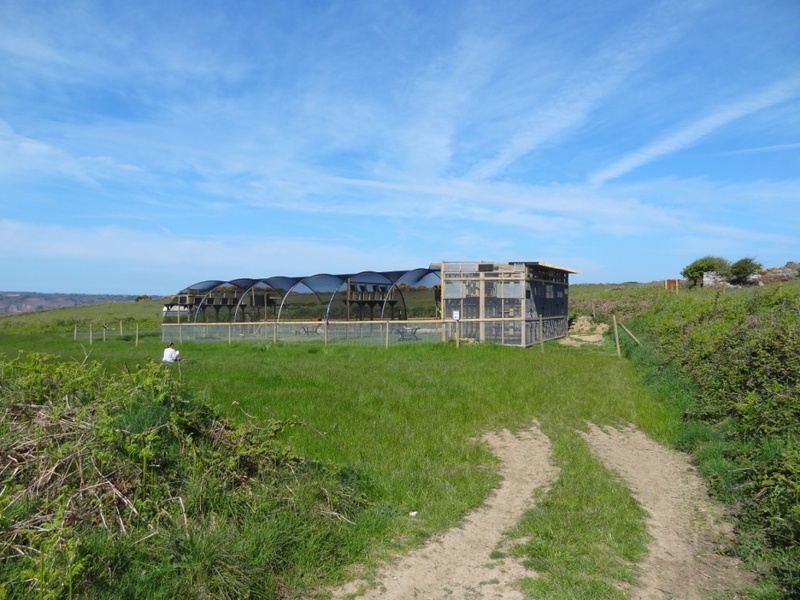 There have been several practice sessions this month on how to radio-track choughs. More importantly, learning how the Jersey landscape affects radio frequencies and discovering the practicalities involved. Initially this involved checking that the transmitters on the birds were working and seeing how far the signal will travel. When feeling a bit more adventurous this progressed to seeing if keepers could track down a live moving target. Durrell staff, with transmitter in hand, kindly volunteered to be ‘choughs’ and hide somewhere between Sorel point and Devil’s Hole. 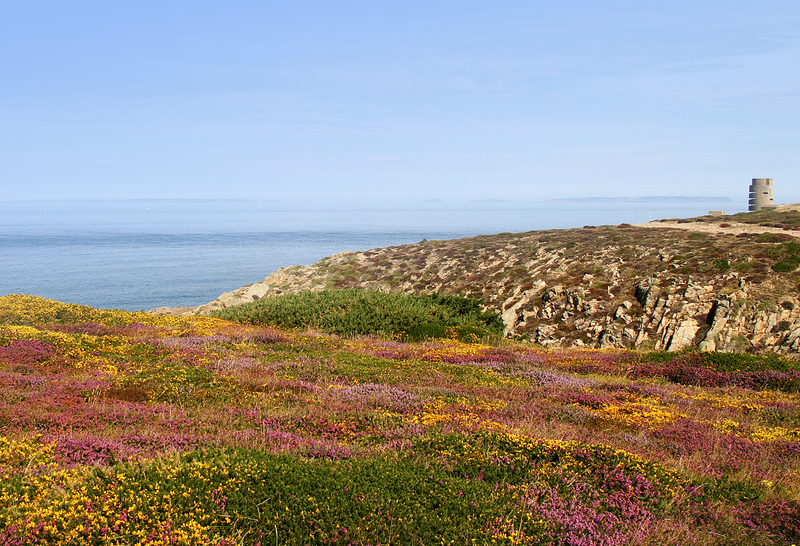 They took the role to heart by belly-crawling through gorse bushes and sitting on cliff tops. Despite all their efforts to deceive the radio-trackers they were all found and pretty quickly. Next test….paragliding volunteers! 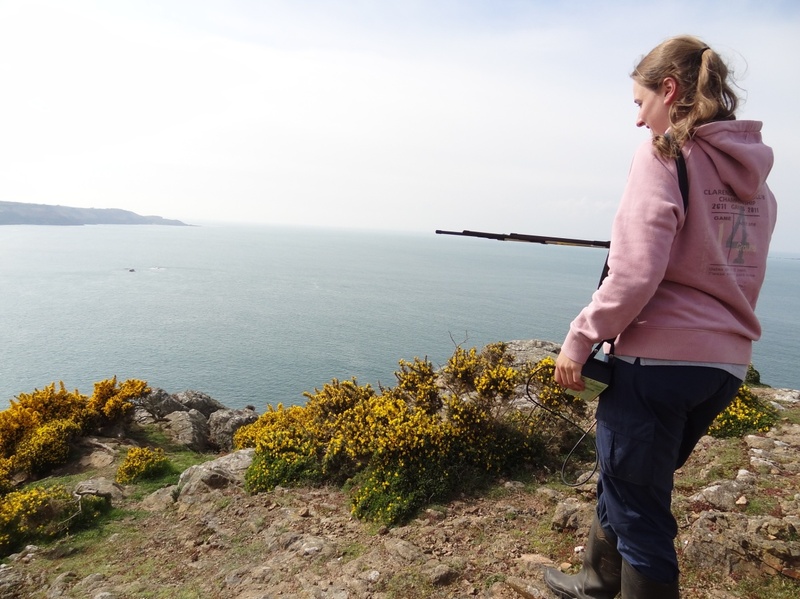 Jess Maxwell, a Durrell intern student, is assisting with the field project and undertaking a behavioural study for her degree. Her observations started this month and will continue post-release. These studies involve Jess sitting in a field for two hours each day which is why Jess is very grateful for the recent weather improvements. She is studying the group dynamics to see if they behave the same pre- and post-release and try to assess what is the ideal cohort size for release. Hopefully this work will be replicated with future releases and the data can be used to evaluate the ongoing project. With the last of the release birds being moved out of the display aviary we are now left with three birds in there including Gianna. These choughs have been joined by a pair of breeding toads who have decided to spawn in the choughs’ ‘pond’! 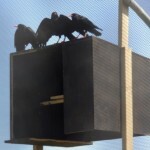 Keepers have provided the choughs with water bowls to deter them from going near the pond. At the time of writing we now have tadpoles. 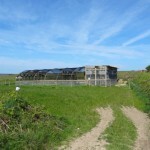 Our two breeding pairs of choughs have been very busy off show. Keepers provided nesting material in the appropriate stages; large twigs, heather thatch and finer twigs, wool and horse hair. Both pairs set to work building nests and completed them relatively quickly. Keepers never witnessed any copulation, but on the morning of the 22nd they did see their first egg. 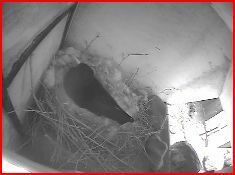 Unfortunately this was when Issy got off her nest, walked along the shelf and laid the egg there much to the dismay and confusion of the keeper watching. On inspection of the nest camera it looked like there was an egg in the nest too (although the wool can be deceptive) so the shelf egg could be the second egg not the first. 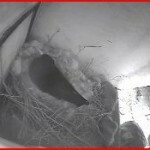 On the 25th, keepers thought they could see three eggs in the nest and by the 26th Issy was sitting tightly on them. If all goes to plan these eggs should hatch towards the end of May. Keepers are not sure if Arthur and Gwinny are up to anything. We do know that they have a nest. 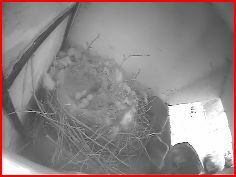 Somehow the camera lens moved position so we do not have a clear view of the nest but from their behaviour it doesn’t appear that Gwinny is sitting on eggs. We don’t want to disturb them so will continue as normal and monitor them as closely as we can. 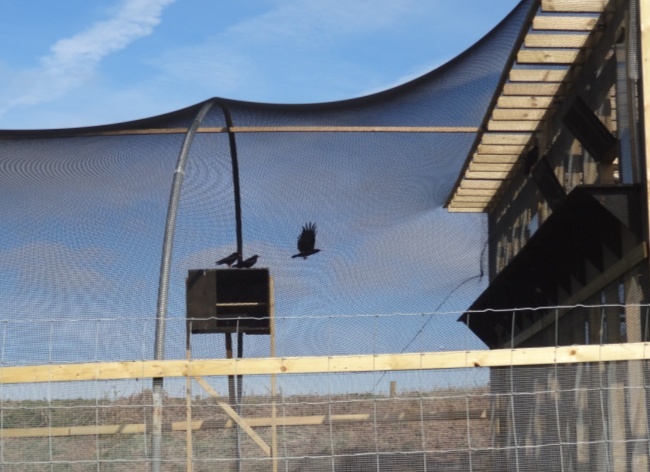 Keepers have also been kept busy at the display aviary after members of the public reported seeing the choughs “trying to escape”. Being inquisitive birds they investigate everything including broken threads in aviary netting. It wasn’t an escape attempt more a quality assurance test. The height of the aviary makes it very difficult to repair holes in the netting with just a ladder and a good head for heights. Jono le Maistre, tree surgeon, kindly offered his assistance and with harnesses firmly attached climbed the poles to fix the netting. What a lot of work for these Birds, lets hope that it all turns out to be successful. 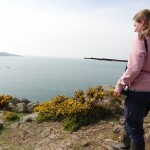 great work bird keepers, and a really interesting report Liz thanks. Re-introductions are never easy and the more effort that goes in to them the more likely a success. Well done team for the fantastic work! I am hoping to learn a lot from this.